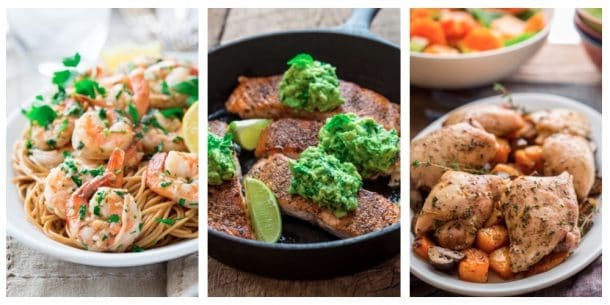 This simple salmon recipe is everything! It’s a little spicy, a little sweet and is ready in 20 minutes or less! Sprinkle salt all over the salmon. Heat a large oven-proof skillet (preferably cast iron) over medium-high heat. Add oil and brush over the bottom of the skillet with a heat proof pastry brush. 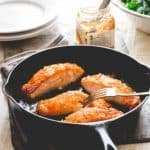 When oil is very hot, lay salmon in the skillet, skinned side-down and let cook undisturbed until the bottom is browned and the fish releases easily from the hot skillet, 3 to 4 minutes. Meanwhile, stir marmalade and Sriracha in a small bowl. Carefully flip fish over and spoon the marmalade mixture over the fish. Transfer the skillet to the oven and let continue cooking until the fish is just barely opaque in the center, 2 to 4 minutes for medium-well. Serve hot.